Here are 2 free online PDF metadata editors. You must have some PDF(s) which contains incorrect metadata or some metadata entry is missing there. In such cases, these PDF metadata editor websites will come in handy. You will be able to add/edit PDF author name, title, created date and modified date, subject, keywords, etc. Do the changes and then you can save the PDF with the added metadata information. While one website in this list is handy to fill basic metadata information, another website lets you add some more details like PDF version, creator, etc. These websites can also help you edit metadata of password protected PDFs. 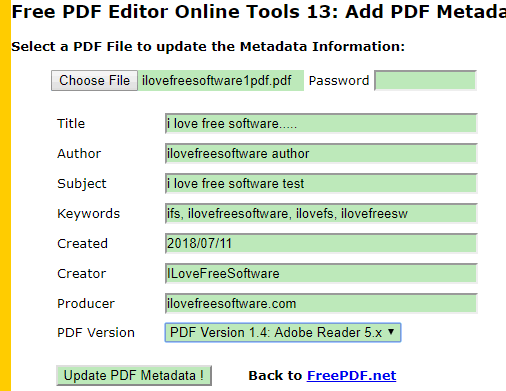 Let’s check these free PDF metadata editor websites. PDFill.com is one of the best options to edit PDF metadata online. You can change metadata of password protected PDF file also. Just add PDF and then provide the password in the available box. After that, you can fill metadata information which includes PDF author, producer, creator, created date, PDF version (preset options are available to choose from), subject, keywords, etc. When the metadata is ready, press on “Update PDF Metadata !” button. It will create the output PDF with the added metadata information and then open that PDF in a new tab. From that tab, you can download the output and use it. It is simply good. The only thing you need to take care is it supports maximum 5 MB PDF. PDFCandy has a handy tool that lets you edit metadata of PDF file with ease. Here is the homepage of that PDF metadata editor tool. You can upload PDF document (maximum 10 MB) from PC or your Dropbox account. The feature to add PDF from Google Drive is also there but it doesn’t work for now (temporary issue). Once the PDF is uploaded, it shows metadata fields with available data. If there’s no data, then each field will remain empty. It can also help you edit metadata for password protected PDF. But first, it will prompt you to unlock PDF with its another tool. When the metadata fields are in front of you, you can fill details like creation and modification date, author name, title, subject, and keywords. Add information, apply changes, and then download PDF to PC or Dropbox. Before downloading the PDF, you can also see some important details like PDF size, added metadata, total number of pages in PDF, page numbers are added or not, etc. If these are the options that you are looking for, then this tool definitely deserves a try. If you prefer software over online tools or don’t want to upload your PDF somewhere, then you may check this list covering best free PDF metadata editor software. Among these two PDF metadata editor websites, I will prefer the first one. The only reason is it supports password protected PDF file directly and provide more fields for metadata like PDF creator, producer, and PDF version. Though size limit is only 5 MB, it is good for small PDF files.